We carry every piece of historical clothing you will need for an impressive musketeer costume or outfit. Our inventory includes a variety of musketeer tabards decorated with symbols like silver crosses and fleurs-de-lis, while others show off designs inspired by the wicked Cardinal Richelieu from Alexandre Dumas popular novel. The generous cut of these musketeer garments will allow plenty of freedom of movement for deadly sword play or wooing courtly beauties. 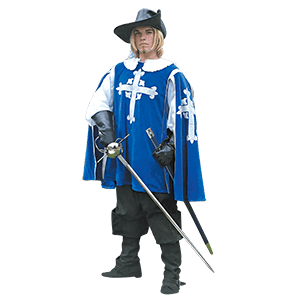 We also provide musketeer boots, musketeer shirts, and musketeer pants that are ideal for the Renaissance fair or theatrical productions. We also host a variety of musketeer accessories like rapier baldrics and frogs, excellent cavalier hats and musketeer hats with dramatic plumes, and swordsman gloves to finish off your look. Musketeer rapiers and swords have an important place in history and popular culture. The musketeers were masters of swordplay, using their skills to defend the king and queen. They remain well-known figures due to the Alexandre Dumas novel, The Three Musketeers, which relates the adventures and misadventures of DArtagnan, Athos, Porthos, and Aramis. We carry excellent musketeer swords, main gauches, and Renaissance rapiers that can be used for display or reenactments. Our functional musketeer rapiers are made from quality steel to withstand sword fights and duels. 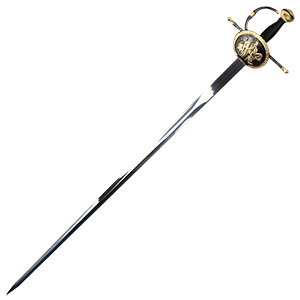 Other cavalier rapiers are purely decorative with attention to detail and intricate designs. Whether you are a collector or modern warrior, you can be sure to find excellent musketeer blades here.